Mutant Mass is without a doubt the most complete and effective weight gainer formula in the world! When it comes to packing on quality mass, bodybuilders all over the world rely on Mutant Mass. After years of relentless research and development, Mutant Mass has been specifically formulated with one goal in mind — to help you quickly pack on MUTANT size! Every serving of Mutant Mass delivers 52 grams of muscle-building protein featuring the Mutant Pro Multi-Staged 10 Protein Matrix. The unique protein matrix found in Mutant Mass supplies the body with 10 complete protein sources, which provides an immediate and long-lasting increase in protein synthesis! When you combine the powerful protein matrix with the other key anabolic nutrients found in Mutant Mass, you have the ultimate formula for rapid gains in rock-hard mass! A wide variety of protein sources deliver a vast cross spectrum of amino acids, which triggers greater uptake by muscle cells. The multi-staged protein matrix found in Mutant Mass is designed to shuttle more usable protein into your muscles and flood them with a continuous supply of muscle-building amino acids — all day and all night! Mutant Mass has been developed based on mountains of scientific evidence from a countless number of research studies. Precisely engineered to help you quickly pack on pounds of muscle, every aspect of the Mutant Mass formula has been researched and tested to ensure it is without a doubt the most effective weight gainer on the market! Research Study Shows You Can DOUBLE Your Gains! What does each Matrix found in the Mutant Mass formula do? Provides your body with 10 different sources of complete protein. Includes a unique combination of fast-acting and slow-release protein sources. Provides your muscles with a constant supply of amino acids to enhance muscle growth, tissue repair and recovery — all day long! Includes waxy maize and waxy barley starch, which are absorbed faster than any other carbohydrate sources! Increases the speed and magnitude of muscle glycogen refueling to a greater degree than other carbohydrates. Maximizes exercise performance and enhances recovery. Delivers a unique combination of top-quality ‘lean' fats (including MCTs, CLA and Flax oil) to enhance muscle growth, reduce fat storage and support fat loss — all at the same time! Delivers a cutting-edge form of enzymatically modified peptide bonded glutamine, which maximizes muscle cell volume and enhances muscle recovery. Includes colustrum and Insu-Drive™ Complex (Cinnulin-PF® Patented Aqueous Cinnamon Extract), which enhances the efficiency of insulin and the digestive system, thereby improving nutrient uptake by muscles. What are the 10 protein sources found in Mutant Mass? Mutant Mass includes a unique combination of fast-acting and slow-release protein sources. The fast-acting protein sources include, whey protein isolate, whey protein hydrolysate, and three different whey protein concentrates. The slow-release proteins include micellar casein, milk protein concentrate, calcium caseinate, egg white albumin protein, and milk protein isolate. What types of fat are found in Mutant Mass? 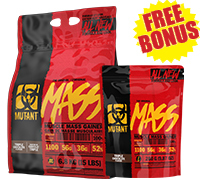 Mutant Mass delivers a unique combination of top-quality ‘lean' fats, including medium-chain triglycerides (MCTs), conjugated linoleic acid (CLA) and flax seed oil powder. What types of carbohydrates are found in Mutant Mass? The primary carbohydrate sources found in Mutant Mass are waxy maize and waxy barley starch, which are absorbed faster than any other carbohydrate sources. Mutant Mass also contains maltodextrin (a complex carbohydrate source) for a sustained supply of energy for muscles. How do you use Mutant Mass? Mutant Mass can be used anytime throughout the day when your body needs an extra surge of muscle-building calories and nutrients. Simply shake or mix 4 scoops of Mutant Mass with 480-960 ml (16-32 fl oz) of water or milk. To ensure maximum growth and recovery, many bodybuilders and athletes drink one Mutant Mass shake first thing in the morning, and a second immediately after training. Average weight gain in just 10 days was 3.7 pounds of muscle! 92% reported increases in bicep and chest measurements! 100% would recommend it to others wanting to add LEAN mass! Reference: (1) Rozenek R, Ward P, Long S, Garhammer J. (2002). Effects of high-calorie supplements on body composition and muscular strength following resistance training. J Sports Med Phys Fitness, 42, 340-347.